The Aurora car accident attorneys at Rosenfeld Injury Lawyers LLC know that a single careless moment, heavy traffic, unexpected distraction, roadway inattention or drunk driving can cause an accident leading to severe injuries and fatalities. Due to the massive population within the thriving Chicagoland Metropolitan area, it is no wonder that accident-related deaths occur all too frequently in its large cities and small communities including Aurora, Illinois. If you or a family member was injured in an auto accident and are in need of an Aurora car accident lawyer, contact Rosenfeld Injury Lawyers LLC today for a free consultation. If you were involved in an Aurora car accident, we invite you to contact our law firm for a free case review to discuss your legal rights and options. Our law office has experienced with all phases of car accident injury claims including insurance negotiations, litigation, and uninsured motorist arbitration. Talk to an Aurora car accident lawyer without any cost or obligation today. Congested traffic on the Ronald Reagan Memorial Highway (Interstate 88) and challenging intersections like Indian Trail at Eola can create dangerous conditions that often produce serious accidents where innocent victims lose their lives. Bike and pedestrian accidents are also common occurrences within the Aurora city limits as are motorcycle accidents and collisions involving commercial trucks. Many of these accidents are caused by various factors including potholes, missing signage, poor lighting, adverse weather conditions and driving mistakes. In March 2015, a Chicago woman lost her life and four others in the car suffered serious life-threatening injuries in a single-vehicle crash that occurred in the early morning hours within the Aurora city limits. Just before 2:30 AM, a 2000 Chevrolet Malibu was traveling at an excessive rate of speed in the southbound lane of Farnsworth Ave when the vehicle swerved off the roadway and struck a power pole installed south of Front Street at Grove Street. The impact was so severe it knocked down power lines, disconnecting electricity for neighboring ComEd customers. Two passengers inside the vehicle were ejected due to the force of the collision. The 21-year-old female driver was pronounced dead at the accident scene. All survivors in the vehicle were transported to local area hospitals including one victim who needed to be airlifted to a trauma center. Just two weeks later, an elderly driver lost his life in a collision occurring at the busy Aurora intersection of Diehl and Eola Road. The accident involved a semi-truck and a third vehicle. The 89-year-old man was killed at the scene and his wife suffered injuries. The driver of the other vehicle and the trucker were not injured. The accident closed the busy crossroad for hours while investigators managed the scene. While these fatal auto accidents are tragic, they are hardly unique events for the city of Aurora and neighboring communities. According to the latest statistics, the city was the scene of five fatal accidents occurring in 2013 that took seven lives. Two of those accidents involved drunk driving. 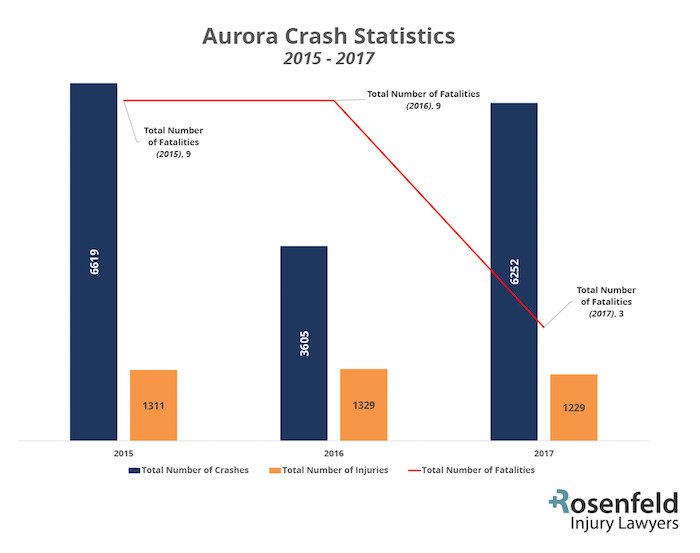 The number of total accident-related deaths in Aurora rose substantially from the previous year when three fatalities occurred within the city limits. Alternatively, some accidents are not the fault of the driver but the result of negligent roadway designs, a lack of road planning or insufficient street maintenance. Blocked culverts, plugged draining ditches, and bad weather can all lead to serious car accidents involving fatalities. Why Hire Aurora Car Accident Attorneys at Rosenfeld Injury Lawyers LLC? 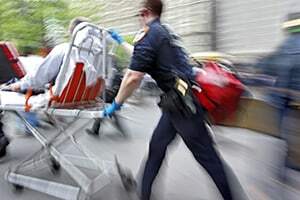 Personal injury laws used to file claims and lawsuits often involve negligence, recklessness or carelessness of drivers who fail to use reasonable care that causes harm to others. These types of personal injury claims typically encompass accidents with vehicles, pedestrians, bikes, commercial trucks, boats, and motorcycles. Many victims filing a claim or suit seeking monetary funds will hire personal injury lawyers who specialize in vehicle accidents. This is because accident injury claims and wrongful death lawsuits are complex to litigate. To successfully resolve a claim, the victims or their attorney seeking compensation on their client's behalf must prove how others were negligent or at fault for the injuries or death. A hired attorney can oversee the entire claim for compensation to ensure that the victims or surviving family members receive adequate recompense for medical expenses, burial costs, property damages and other losses. Nearly all personal injury cases and wrongful death lawsuits are settled out of court through an agreement between the insurance carrier and the victim or their surviving family members. Unfortunately, many claims adjusters use unsavory tactics by sounding sympathetic to the victim’s problems while simultaneously offering a low settlement. This is because the insurance company is highly motivated to close the claim by settling for the least financial amount possible. Because of that, many victims will hire an Aurora personal injury law firm to ensure that the insurance company acts in good faith. Our legal team is not swayed by aggressive auto insurance companies and intimidating defense lawyers. We have built a solid reputation through passionate representation to achieve the highest amounts of financial compensation for our clients. Our decades of experience and successful litigation practices have proven to be very successful. We use our passion for the civil legal system to fight for you and maximize your recovery in Aurora car accident cases.